Этот сайт использует файлы cookies. Если вы хотите узнать больше или изменить свои настройки, наша политика cookie к вашим услугам.Если вы продолжаете пользоваться веб-сайтом, мы предполагаем, что вы соглашаетесь с использованием файлов cookies. Two ZU650 laser projectors with short throw lenses warped and blended onto curved 5m wide screen with a Chameleon GB-200 blending processor. Heritage Interactive, based in Leicestershire, is a leading interactive agency working in the Museum, Heritage and Exhibition sectors. It enhances environments with interactive and AV solutions to create engaging and memorable experiences for visitors. 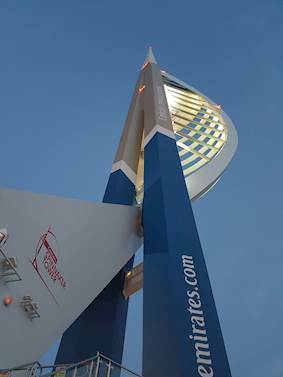 Задача: The Emirates Spinnaker Tower wanted to create an eye-catching entrance with a large immersive introduction to the city of Portsmouth, its history and the tower’s place within it. 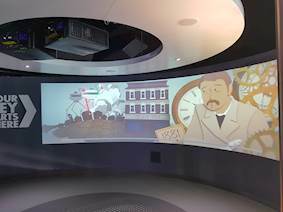 Решение: Heritage Interactive installed two ZU650 laser-phosphor projectors warped and blended with a Chameleon GB-200 blending processor to project a five-minute animated film onto curved 5-metre wide wall. Soaring 170 metres above Portsmouth Harbour and the Solent, the Emirates Spinnaker Tower is taller than the London Eye, Blackpool Tower and Big Ben and has become one of Portsmouth’s major attractions since it opened in 2005. Visitors can walk across its 100m high glass skywalk and get breathtaking panoramic views of the city, country and seascapes stretching 37 kilometres (23 miles). The attraction wanted to place the venue in the context of the city and create an eyecatching entrance with a large immersive introduction to the city of Portsmouth, its history and the Tower’s place within it. This would be in the form of an animated film projected onto a 5-metre wide curved wall to excite and captivate visitors as they enter the attraction. It was important to the venue that the projectors are quiet, unobtrusive and, most importantly, reliable. Heritage Interactive installed two of Optoma’s 6,000-lumen laser-phosphor projector, the ZU650, with short throw lenses. This high brightness WUXGA resolution ProScene model with 2,000,000:1 dynamic contrast provides 20,000 hours of impressive, virtually maintenance-free operation without the need for lamp or filter replacements. This makes it an ideal solution for installations where access is problematic or restrictive. It is also suited to quieter environments, smaller rooms or those with low ceilings due to the fact it has no lamp – so needs less cooling. Flexible installation is provided by 360˚ rotation and portrait mode operation, combined with an extensive lens shift range and five optional lenses. HDBaseT comes as standard and almost all functions of the projector can be controlled remotely across a network. 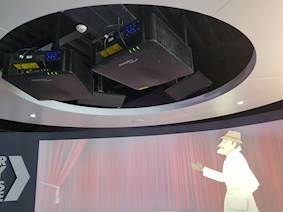 The projectors were warped and blended with a Chameleon GB-200 blending processor to project a five-minute animated film onto curved 5-metre wide wall. quick and easy. 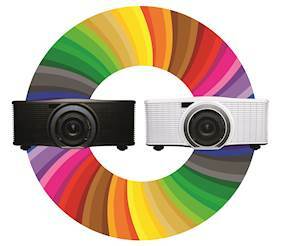 In addition, it allows sub-pixel control of the alignment of both images with up to 289 individual points of adjustment on each projector enabling use on both flat and curved surfaces. The Chameleon can also be used for stacking, when a project needs higher lumens. Stacking overlays images from multiple projectors to produce a higher brightness. Completed in 2016, the animated film takes visitors on an entertaining historical journey through the bustling port city of Portsmouth including its infamous pirates and famous residents such as Queen Victoria and HG Wells. Cookie — это небольшая порция текстовой информации, которую сервер передает браузеру. Файлы Cookie используются для облегчения процесса поиска и навигации по сайту. Благодаря им можно определить, какие страницы являются наиболее интересными. Это поможет нам улучшить сайт. Если диалоговое окно будет закрыто без дополнительных указаний, Cookie будут разрешены по умолчанию.